So you have finally found your dream job in Windows Server but are wondering how to crack the Windows Server Interview and what could be the probable Windows Server Interview Questions. Every interview is different and the scope of a job is different too. 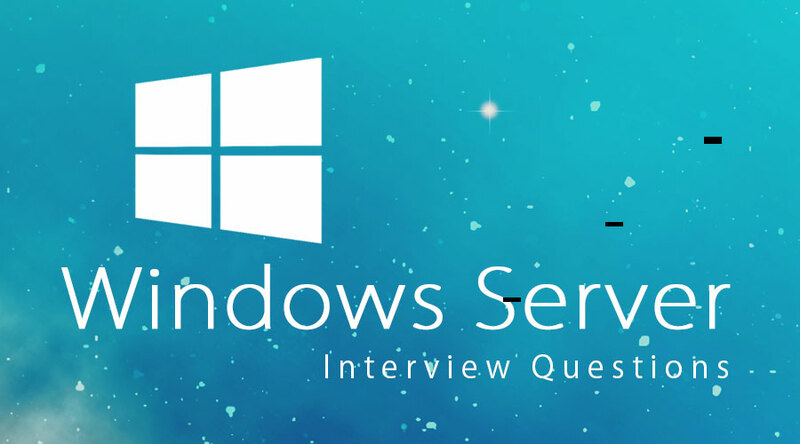 Keeping this in mind we have designed the most common Windows Server Interview Questions and answers to help you get success in your interview. 1. What is an Active Directory? Active Directory (AD) is a directory service which is used in a directory to store objects like user profiles, network information, computers. It helps to manage the network effectively with the help of Domain Controllers which are present at different locations with the Active Directory database. Some of the functions include central administration with multiple geographical locations, authentication of users and computers in a windows domain, replicating Active Directory from any Domain Controller which in turn will be replicated to all other Domain Controller’s. 2. What are some of the roles of FSMO (flexible single master operations)? 3. Tell Me About Active Directory Database And List The Active Directory Database Files? All the Active Directory changes are not written directly to the NTDS.DIT database file. They are first written to EDB.Log and thereon from the log file to the database. EDB.Che is used to tracking the updates to the database it acts as an update log file to check what operations are performed to the database. NTDS.DIT: This is the Active Directory database and contains all the AD objects. The default location is %system root%nrdsnrds.dit, this database is based upon the Jet database. EDB.Che: This file is used to check for the data that is not yet written to a database. This file has the starting point to the data can be recovered during failures. Res1.log and Res2.log: Res stands for reserved transaction file which provides the transaction log file enough time to shut down if the disk runs out of space. 4. What Is Use Active Directory Partitions? And How To Find The Active Directory Partitions And There Location? Domain Partitions– This partition stores the information of the domain which includes user, computer, group, printer etc. this partition also replicates to all domain controllers which are present in the domain. 5. What are GPOs (Group Policy Objects)? Let us now have a look at the advanced Windows Server Interview Questions. 6. What do Forests, Trees, and Domains mean? 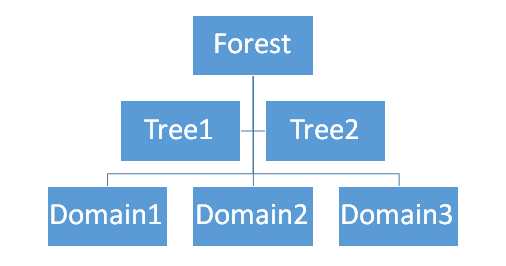 The logical divisions of an Active Directory network are known as forests, trees, and domains. A logical group of network objects for example computers, users, devices etc which share the same active directory database is known as a domain. The collection of one or more domains is known as a tree. This may also include a contiguous namespace linked in a transitive trust hierarchy. The collection of domains is known as the forest which shares a common global catalog, logical structure, directory configuration and directory schema. It also defines the security boundaries for users, groups, and computers. 7.Non-authoritative Restore of Active Directory? During non-authoritative restore, the domain controller is set back to its initial state (the state at the time of backup was taken). Once it’s done it allows overwriting its initial state with the changes that were done after the initial backup was taken. Now for updating the Active Directory database, queries are fetched by the domain controller from replication partners to ensure that the Active Directory is up to date and accurate. Whenever there is data loss or corruption in the Active Directory this method is used (default). 8.Authoritative Restore of Active Directory? 9. Explain in windows DNS server what is Primary, Secondary and Stub zone? 10. Explain what is the major difference between NTFS (New Technology File System) or FAT (File Allocation Table) on a local server?